Thick-skinned bottle gourds widely used as containers by prehistoric peoples were likely brought to the Americas some 10,000 years ago by individuals who arrived from Asia, according to a new genetic comparison of modern bottle gourds with gourds found at archaeological sites in the Western Hemisphere. The finding solves a longstanding archaeological enigma by explaining how a domesticated variant of a species native to Africa ended up millennia ago in places as far removed as modern-day Florida, Kentucky, Mexico and Peru. The work, by a team of anthropologists and biologists from Harvard University, the Smithsonian Institution's National Museum of Natural History, Massey University in New Zealand and the University of Maine, appears this week on the web site of the Proceedings of the National Academy of Sciences. Integrating genetics and archaeology, the researchers assembled a collection of ancient remnants of bottle gourds from across the Americas. They then identified key genetic markers from the DNA of both the ancient gourds and their modern counterparts in Asia and Africa before comparing the plants' genetic make-up to determine the origins of the New World gourds. "For 150 years, the dominant theory has been that bottle gourds, which are quite buoyant and have no known wild progenitors in the Americas, floated across the Atlantic Ocean from Africa and were picked up and used as containers by people here," says Noreen Tuross, the Landon T. Clay Professor of Scientific Archaeology in Harvard's Faculty of Arts and Sciences. "Much to our surprise, we found that in every case the gourds found in the Americas were a genetic match with modern gourds found in Asia, not Africa. This suggests quite strongly that the gourds that were used as containers in the Americas for thousands of years before the advent of pottery were brought over from Asia." 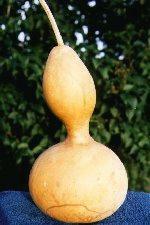 The researchers say it's possible the domesticated gourds were conveyed to North America by people who arrived from Asia in boats or who walked across an ancient land bridge between the continents, or that the gourds floated across the Bering Strait after being transported by humans from their native Africa to far northeastern Asia. "These people did not arrive here empty-handed; they brought a domesticated plant and dogs with them. They arrived with important tools necessary to survive and thrive on a new continent, including some knowledge of and experience with plant domestication," says co-author Bruce Smith of the Smithsonian Institution. Thought to have originated in Africa, bottle gourds (Lagenaria sicereria) have been grown worldwide for thousands of years. The gourds have little food value but their strong, hard-shelled fruits were long prized as containers, musical instruments and fishing floats. This lightweight "container crop" would have been particularly useful to human societies before the advent of pottery and settled village life, and was apparently domesticated thousands of years before any plant was domesticated for food purposes. Radiocarbon dating indicates that bottle gourds were present in the Americas by 10,000 years ago and widespread by 8,000 years ago. Some of the specimens studied by the team were not only the oldest bottle gourds ever found but also quite possibly the oldest plant DNA ever analyzed. The newest of their archaeological samples, a specimen found in Kentucky, was just 1,000 years old - suggesting the gourds were used in the New World as containers for at least 9,000 years. The team watched an 8m rift develop in the ground in just three weeks in the Afar desert region last September. It is one small step in a long-term split that is tearing the east of the country from the rest of Africa and should eventually create a huge sea. 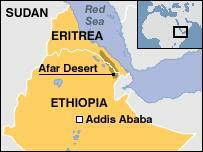 The UK-Ethiopian group says it was astonished at the speed with which the 60km-long fissure developed. "It's the first large event we've seen like this in a rift zone since the advent of some of the space-based techniques we're now using, and which give us a resolution and a detail to see what's really going on and how the earth processes work; it's amazing," said Cindy Ebinger, from Royal Holloway University of London. Professor Ebinger and colleagues described the event here at the American Geophysical Union Fall Meeting. In the far-distant past, oceans such as the Atlantic have formed when supercontinents have torn apart. Indeed, North America and Europe are still moving in opposite directions at about the pace fingernails grow. Researchers have long recognised that the Afar region, an inhospitable depression in north-eastern Ethiopia, has been contorted by similar forces in recent geological time. But the event in September is said to be unprecedented in scientific history. It began with a large earthquake on the 14th of the month and continued with a swarm of moderate tremors. "About a week into the sequence, there was a volcanic eruption," explained Dr Ebinger. "A lot of ash was thrown up in the air, and a lot of cracks appeared in the ground; some of which were more than a metre wide. "Using satellite techniques we can see ground deformation, and about a month after the sequence, we could see a 60km long section had opened up, and it opened up about 8m in its central part. "It appears that we've seen the birth of an ocean basin." Check here for the full story. I have to say I wasn't a bit surprised to see this article by Beyondo98 And perhaps this outside pressures will inspire the people of the US to take back control of the country, policies , etc. Surely this audience doesn't need another reason to hang their head low these days. We fight and fight and things deteriorate. Nevertheless I feel compelled to share with you what the world looks like from Berlin, where as the dutiful employee at a powerful American NGO, I have witnessed America' soft power in Europe evaporate in the period of roughly four months. It began with Katrina. It continues with al-Masri (still a burgeoning scandal in Germany for those who have forgotten about it back home). And now this spying nonsense. Sure, we'll continue to score our high-level meetings with Merkel and Steinmeier, and we'll get our chance to lobby them for our niche cause. But it's our niche cause that gives us the access, otherwise we wouldn't have a prayer meeting with these folks. The truth of it is, what I see in the eyes of our European partners is something much more humiliating than I could have imagined: pity. They know we didn't have anything to do with this crap. And they still meet with us anyway. But whatever moral authority our organization carried with it on the basis of being American is completely gone. America is now a nation well beyond law, abusive of its own citizens, indifferent to mass suffering, and rolling along without any regard for, well, anything. Yeah, we'll continue to meet with the politicos here, but we do it all while trying to avoid talking about where our organization is from and how it derives its wealth. We do it ashamed, and they pity us. Anyone else out there work in Europe and see the same thing?